The Yale Climate Opinion Maps are nothing but astonishing in their depth of coverage. 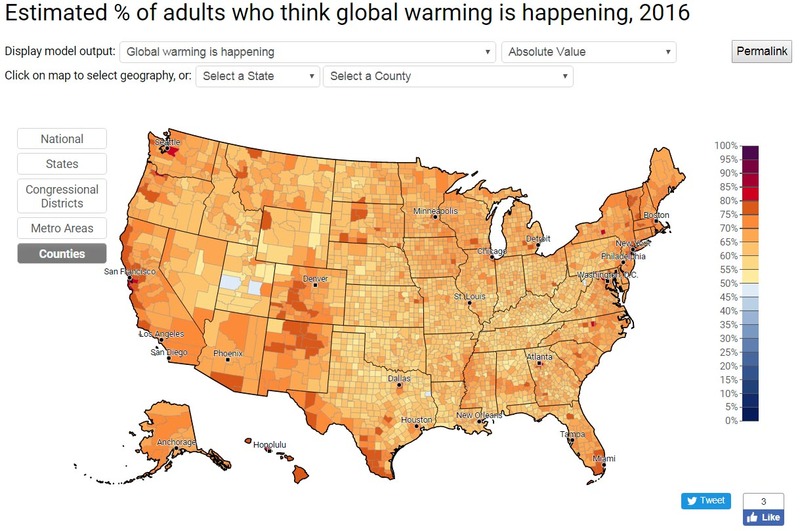 The folks at Yale have accumulated climate opinions nationwide down to the county level in an easy to use interactive format. Their work is truly a fundamentally important way to understand what Americans really think about climate change. Pick your state–pick your county! The takeaway as to how important it is to understand exactly what Americans believe can be understood by clicking through a few boxes on the interactive website and looking at Texan’s beliefs. Because Texas is such a politically conservative state, it would be logical to assume that their beliefs on climate change are similarly conservative, and there would not be much hope for advancing climate change action across the state. Thankfully, reality is quite different.